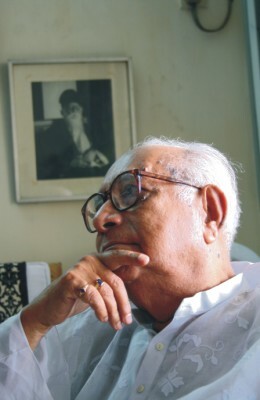 A renowned Tagore exponent in Bangladesh, Kalim Sharafi is identified as one of the most prominent Rabindra Sangeet singers in the subcontinent. Sharafi brought Tagore to life by exploring his compositions and giving them a new meaning. Since the days of the Raj, he has been standing by his people, fighting for independence. A revolutionary, from a very young age, his voice has encouraged the people of Bangladesh even during the liberation war, giving them strength, telling them not to lose hope. President of Bangladesh Rabindra Sangeet Shilpi Sangstha (BRSSS), Sharafi is the recipient of several national and prestigious awards for his outstanding contribution to music, two of them being the Ekushey Padak (1985) and Shadhinota Padak (1999). Now at 84, Sharafi continues to be an inspiring force in the country's cultural landscape.